After 20-year-old Adam Lanza carried out an attack with legal firearms on Sandy Hook Elementary in Newtown, Conn., in 2012, everyone assumed there would be a renewed discussion on gun control in the United States, but it never happened, despite another violent shooting earlier that year in Aurora, Colo. Time passed, and again, in September 2013, a lone gunman stormed a Navy yard in Washington, D.C., killing 12. Months later, in May 2014, a 22-year-old man went on a shooting spree near the University of California, Santa Barbara campus in California, taking the lives of six people and injuring an additional 14. Two more mass shootings in Charleston, S.C., and Chattanooga, Tenn., controlled media headlines in the first half of 2015 alone — and on Thursday, in Lafayette, La., tragedy struck when a gunman opened fire in a darkened theater, killing two women and injuring nine before turning the gun on himself. When mass shootings have become the norm, you know there's a problem. And for all that bloodshed and anger, you would think that 2016 presidential candidates would be willing to talk gun control. The majority, however seem more than eager to skirt the issue or — conversely — reinforce just how important access to firearms really is, despite the cries from the cheap seats. Take Louisiana Gov. Bobby Jindal, for example. Following this week's mass shooting, the presidential candidate returned home from the fundraising trail, suspending his campaign indefinitely to follow the investigation in Lafayette. "As governor, as a father and as a husband, whenever we hear about these senseless acts of violence, it makes us both furious and sad at the same time," said Jindal in a statement to reporters on the scene that night. "[I'm] horrified and shocked [by this] seemingly random act of violence." Right now we’re just learning the details of what happened. ... Let’s focus on the victims right now. Let’s focus on their recoveries. There’ll be a time, I’m sure folks will want to jump into the politics of this. Now is not the time. If Jindal's sentiments sound familiar, it's because he's not the only one espousing them. Newly minted presidential candidate and Wisconsin Gov. Scott Walker downplayed the recent shooting of prayer meeting attendees at a historically black church during a campaign stop in North Charleston, S.C., on July 15, opting instead to praise the local citizens for "bringing people together" during a tragedy rather than dividing them on one particular issue. "It was amazing to see the kind of leadership you provided for this country in what could have been a negative not just for you all, but for this country," said Walker to the crowd of around 200 supporters. "You all showed how to bring people together in this community and this region and this state and in turn you did it for this country." Walker declared that he would "never say [shooter Dylann Roof's] name" aloud, as he didn't want to give any attention to him — falling short of ever actually addressing the shooting itself. It's sad to see the Democrats take a horrific crime and try to use it as an excuse, not to go after people with serious mental illness or people who are repeat felons or criminals, but instead try to use it as an excuse to take away Second Amendment rights of law abiding citizens. I'll tell you, it's reminiscent of Rahm Emanuel who said you can never let a good crisis go to waste. ... I don't think we should be using this tragedy to try and divide people and to try and seek partisan advantage. Those statements, of course, were planted firmly between Cruz's own crudely-timed jokes about Iowa gun control laws ("I'm pretty sure you all define gun control the same way we do in Texas: hitting what you aim at," he scoffed during the meeting) and ill-timed comments he made at a shooting range event later that week ("There's a famous saying, praise the Lord and pass the ammunition," said Cruz, before firing off live rounds from a semiautomatic .223-caliber Smith and Wesson M&P15 sporting rifle). GOP candidates aren't alone in their unwillingness to talk about gun issues. Since President Obama's reelection in 2012, Democrats have largely strayed from the gun control debate, choosing to discuss the topic as it comes up, rather than utilizing it as a regular talking point. But even with the left's hesitancy, conservative candidates have scored far lower on the issue. The left's move is always to say, "Well, let's just take the guns away." ... The fact is, there's always been evil in the world. There always will be evil in the world. The laws that are on the books today are quite adequate. We need to enforce [those laws]. Perry then claimed that, in many of the recent mass shootings, people who "shouldn't have had" the weapons had "somehow gotten their hands on" them, and that the Lafayette shooter in particular had simply been "insane." Perry, like so many of his GOP candidates, avoids the issue of gun control by regularly waving off any real discussion as partisan nonsense in a time of grief. Now is not the time for gun control debate. Now is the time for grieving. But by the way, did you see my stellar NRA rating? At last count, we have 16 candidates for the Republican presidential nomination, and five more for the Democratic nomination. Most of them hurry to talk about anything and everything as soon as they see a microphone. But gun violence is not an issue for them. They won't touch it all. 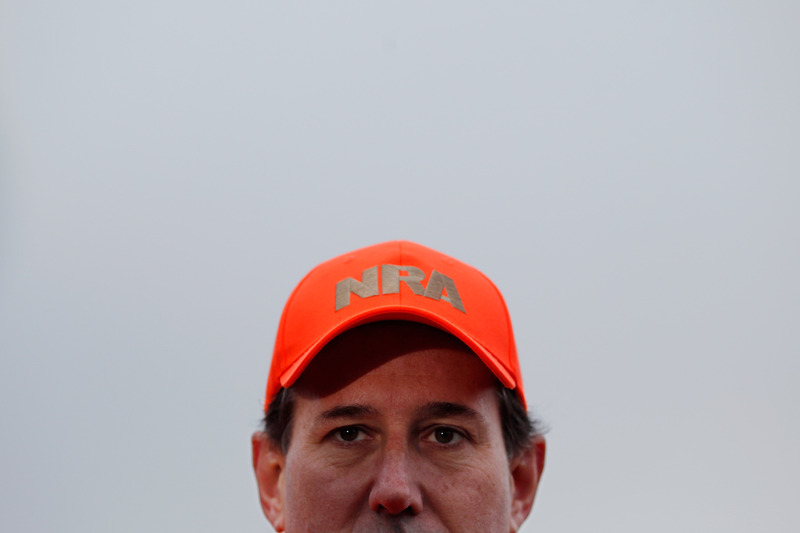 To do so risks the wrath of the National Rifle Association, so they just avoid the issue. Not a peep. Ignoring the rising front of gun violence in the United States and waving off mass shootings as tragedies carried out by the "insane" simply won't fix the problem. If the right continues to ignore the systemic bloodshed being perpetrated under their noses in favor of funneling more NRA and pro-gun donor cash their way, then they, too, should be counted as culpable in the continued carnage that will undoubtedly follow.